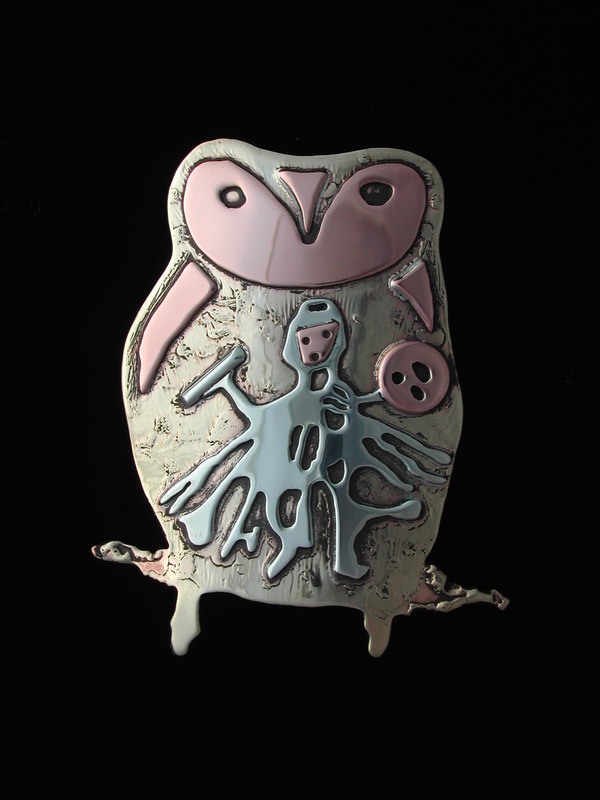 The Owl is my Miahanit, what some people here would call “nagual Medicine Guide” and very sacred to me. It came through the family through my heritage. Owl was the Guide of my Siberian great grandmother, and my grandmother on my father’s side of the family; (Siberian First Nation) But also my Gypsy grandmother had an Owl as a Guardian and for a while had a tame Screech Owl living in her bender and in later years there was another one, Kautze, living in the hole of the Apple Tree of her small garden plot. 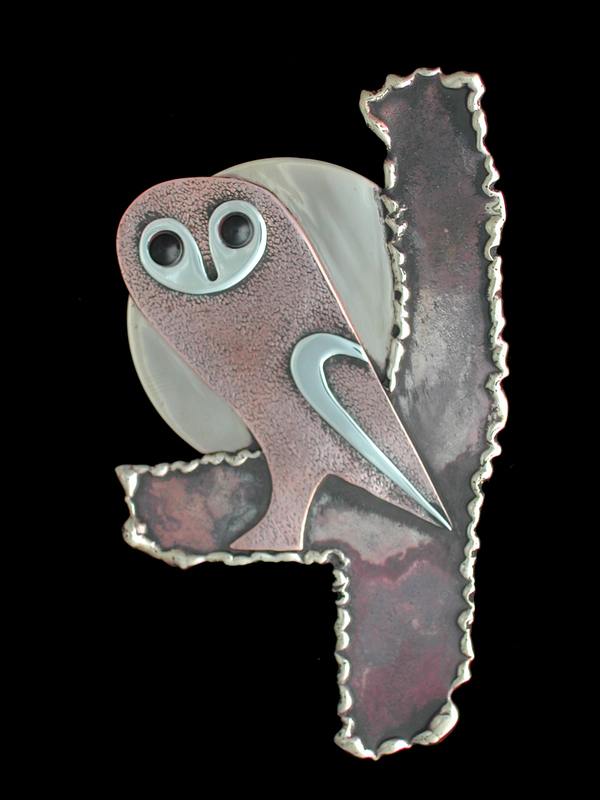 The Owl is the Power that aids and guides me when I work with sick people, to find what is wrong, to find and “see” cancer cells and to work with terminally ill people. 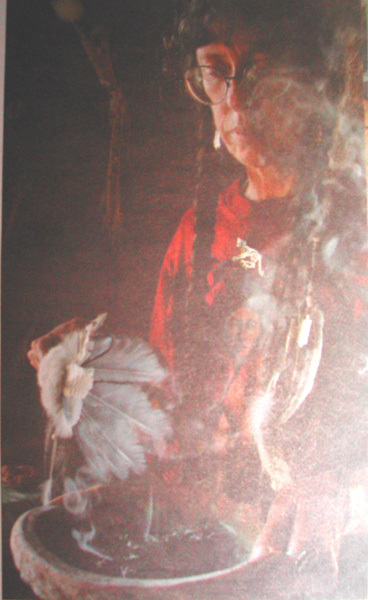 I wear Owl feathers in my braids and also always have some on my ritual drums and regalia. Native people fear the Owl as a messenger that can fly into death and come back from there, but I can only heal when Owl takes me straight there and makes me see what is wrong. …. And sometimes Owl will just show that the person will “walk the wind” soon and all I can do is help them and the family to find peace, closure and loose the fear. In trance journeys I work with 3 Owls. Each has a name. Besides, I was quite young…. Then there is a large Snowy Owl, who only swoops down when I am working with sick clients. She is wise, but aloof and remote. Lately, there is yet another Owl, showing up more and more regularly: A Barn Owl. Most often when my client is of Celtic heritage – or “Western European descend” This one guides me through issues of culture and realms filled with Neolithic Stone Circles and Celtic mythic figureheads, that until recently were utterly foreign territory to me. See, lately I have been working with client after client who have issues of needing to move away from an adopted Native American / new age – eclecticism and re-connect with their OWN ancestral culture in order to get healthy again or resolve longstanding conflicts. 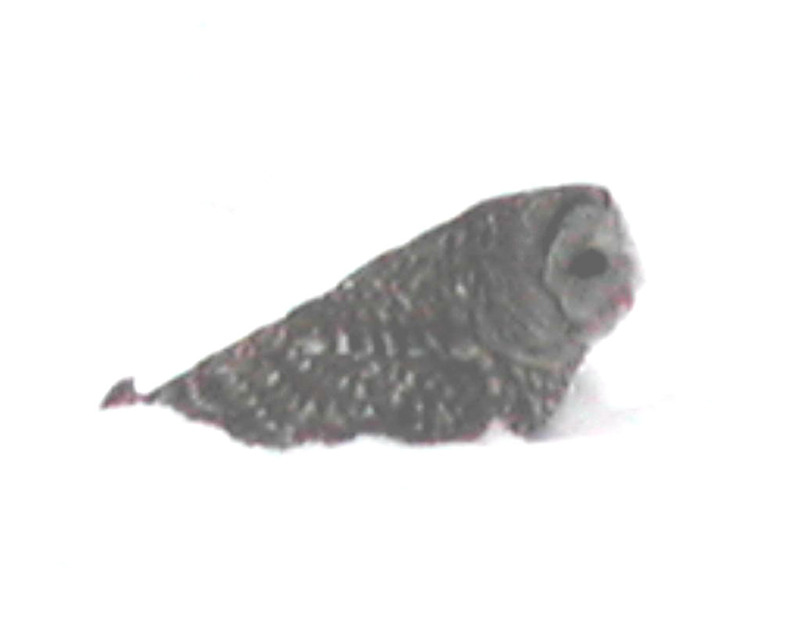 There this Owl, I will here call her White Feather, is immensely helpful, blurping out the ancestral lineage of said client and which Ancestral Guardians feel neglected in such a way, that they no longer support his/ her Life Energy and the client took sick, often with life threatening diseases. White Feather however works under the eye and wing of my large Snowy and it is amazing to see, how fast clients heal, get better, fall into remission, when they follow the Wisdom related by these 2 Guides. Traditionally we would not wear Eagle feathers. Eagles were for hunting by day, for war and also the Eagle Spirit was the instructor for the very first Kham = shaman, wearing his feathers was inappropriate. Nowadays, with all the “shaman- tourism” to Tuva and Westerners bringing Native American drums and cultural values to our people, many have taken to wearing Eagle feathers – for the tourists. And because they are easier to get and you can sell them for good money. See, we have tame Eagles, Gyrfalcons too, we bread them, to hunt and they molt 2x a year….. so you get lots of feathers….. Here, when I wear owl feathers, people think, either I am a crazzzzzy hippie, left over from an era gone by, or I am some type of Native American. The Native Americans however are quite wary of Owls and Owl feathers and often comment on, or ask, why I would wear Owl feathers. Then that becomes a teaching opportunity and I tell them about my culture and our traditions. This is a tricky subject, because it often is the first time that they ever hear of Siberian culture and spirituality and how VERY similar our lore, legends and worldview is. From their days in school they always heard of the land-bridge, and that they supposedly have come from Siberia……. That whole issue however is a good subject for another day…. Often simply out of respect for their culture I do not wear my Owl feathers, when officiating at Pow Wows or attend our Longhouse gatherings. 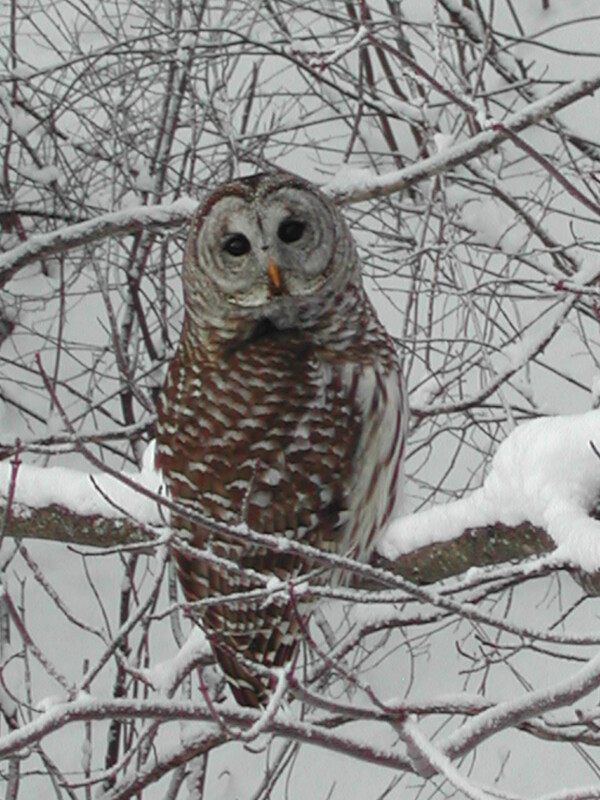 Talking about Owls, the one in the right corner of this blog is one, that wintered on our property one year. Then we have a lovely little Northern Saw Whet Owl that lives in the Spruce forest East of our house and comes at night to hunt Mice and Voles underneath our Bird feeders. She has several refrigerators among the Trees: The upper branches of young Spruce Trees, where the twigs are close enough together to lay a dead Mouse across and let it freeze – for tough times. 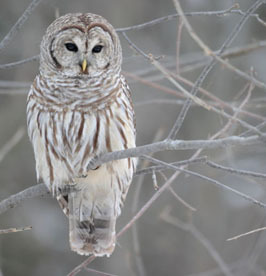 Next there is Kukuku Uuh, our Barred Owl, who nests on the other side of the creek in a large Pine Tree. We have a long relationship. I can call her in – when/ if she is hungry she will come and I will toss her a live mouse, caught in one of our life traps. She will either catch it in mid- air or let it run across the snow and grab it from there. 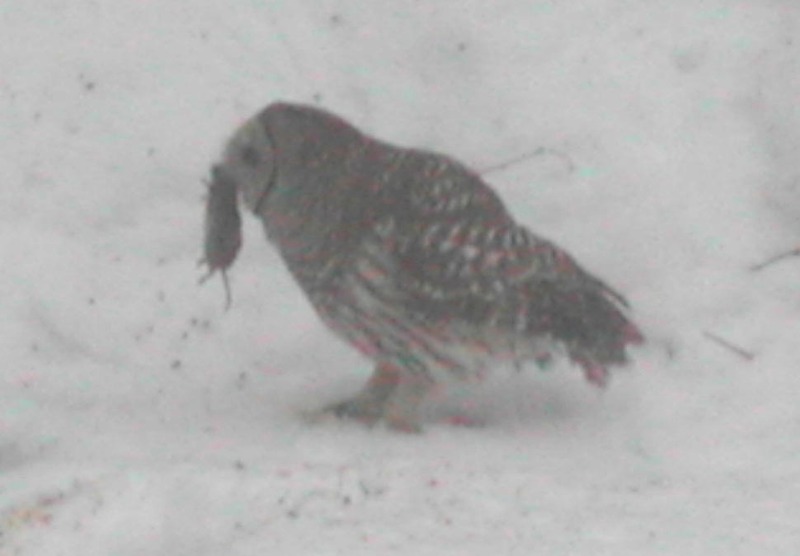 I only do that murderous act, if snow conditions are bad for Owls, when the snow is frozen hard and impenetrable and makes it difficult for Owls to hunt. That on the other side is also the time, when “Kuukie” as we call her, shows up and claims the territory beneath the feeders. On winter with a lot of snow, “Kuukie” literally begged, by sitting on the railing of the upper deck and making “glucksing and coooing” sounds and moving neck and upper body up and down in rapid motion. Then I better have a mouse! When Spring comes Owls become quite vocal and we hear their love calls across the marsh and soon after all becomes very secretive and quiet. The eggs are in the nest…. 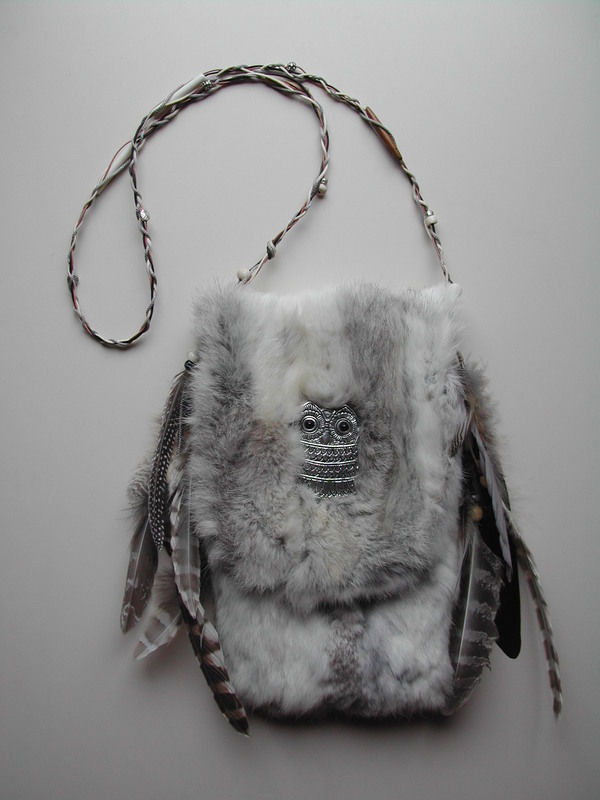 This entry was posted in Shamanism, Wildlife and tagged Owls, Siberia, Traditions, trance. Bookmark the permalink. Enjoyed reading about owls! I can’t word it that well – but i am utterly fascinated with them! Btw, i’d love to read your review of Shapeshifters deck – i am ignorant on the tradition, but i enjoy the artwork, so i wonder whether it makes sense from your perspective! eventually I might dare to write a little more about Owl Medicine and how it is – for me, to work with my Owls and clients…..
Feel free to write about your Owl experiences here – or link it from your blog. Greetings Mi-Shell – I’ve re-blogged this post if that is okay? if not, let me know and I will delete. I love your blog and you have a lot of wisdom. I appreciate you sharing it with us through your blog. Blessings to you and all your readers!